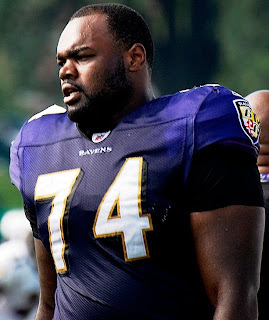 Michael Oher is a young man who is being paid a lot of money to knock people down. He is a star player for the Baltimore Ravens football team and his job is to protect the quarterback. He does this very well. While he is playing right offensive tackle, he played on the left side in college, the blind side of a right-handed quarterback. A couple of you mentioned seeing and enjoying the movie about his life called The Blind Side and so you probably feel very knowledgeable already! Oher was born into a family of twelve children and to a crack-addicted mother. By the time he was sixteen he had been in several foster homes and spent periods of time living on the street. The movie story focuses on the remarkable family who took Oher into their home and did everything possible to give him a chance to excel, which he has done. In the film Sandra Bullock plays the adoptive mom. From what I can gather the film explores this special relationship, but not the school that first gave Oher a scholarship that allowed him the education he needed to get into college. It is Briarcrest Christian School, which offers academic excellence based on strong Christian values. It's motto is "With Man, All This Is Possible; With God, All Things Are Possible." Maybe the makers of the movie felt that they should steer away from religion but don't you think it is good to give credit where credit is due? Whatever the case, it's good to hear about a young person who has overcome a miserable background to make life worthwhile. This story reminds of a New York Times feature, c.2007 in which a homeless girl - living in an tenement stairwell, no less - managed to complete her high school degree and earn a scholarship to Harvard's journalism program. People who defy the odds by rising to success remind us of the sheer happenstance of our birth into loving families that nuture and support us. Most of us really are lucky to have landed where we have in the grand scheme of things! Yes, some people are hungry to succeed despite the odds. Great stories.